Bench cushion girl’s room What little girl wouldn’t love this delicate floral and striped combination sitting area/window treatment? A gently scalloped valance shows off wide pastel stripes on top and finishes off with fun and feminine fringe along the bottom. With matching throw pillows and seat cushion, this will be a favorite little nook for your princess. Cushions girl’s room These pinch pleated side panels drawn back with tasseled tie-backs have a luxurious but fun pattern and feel, with an additional tassel on the pull shade. Two matching throw pillows, a framed swatch, and lap blanket are similar enough to maintain the theme and flow but different enough so as to not overwhelm the eye. 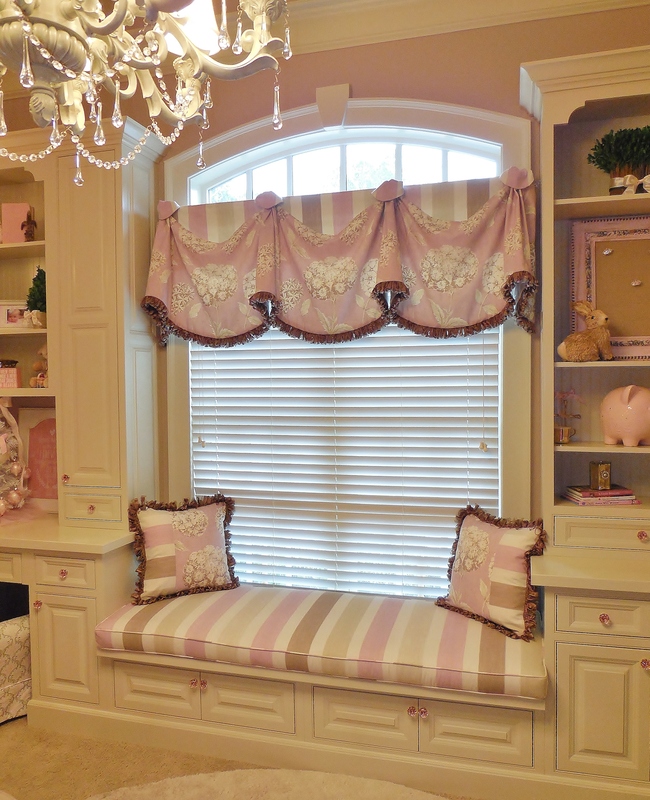 Curtains nursery Two-tone rose colored side panels on a traverse rod hang lusciously along a pair of arched windows to let in the perfect amount of Mother Nature’s warm, loving sun. 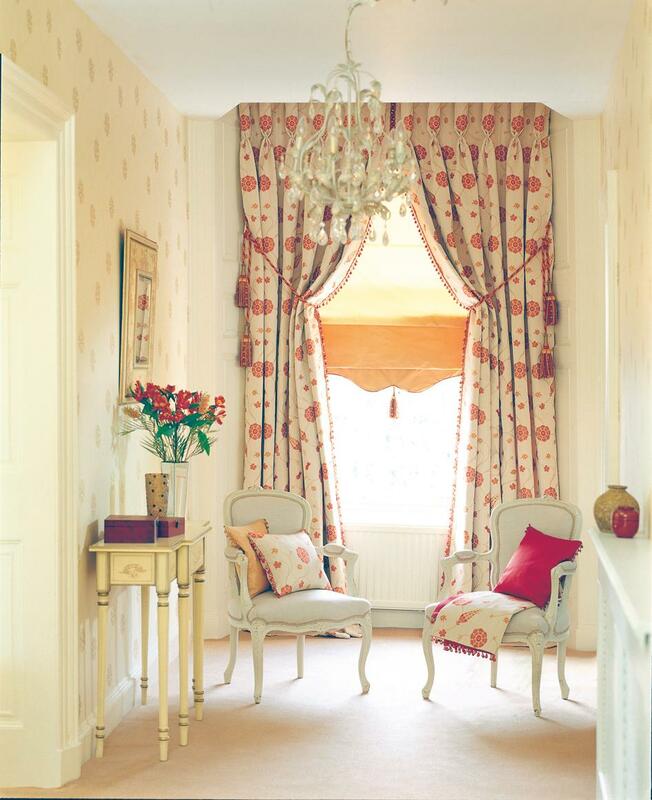 The use of coordinated side panels, matching blanket, and Chinese lanterns lend a bright, fun touch without being too over the top. Designer roller shades A set of four textured roller shades utilizes a neutral and extremely compatible tan to coordinate with almost any color scheme. The effect here is subtle and aesthetically pleasing with rose and blue accessories finishing off the look. These tan shades and light blue wall coloring are a perfect combination leaving the room with a light, airy feel. Vignette Roman shades A set of three Roman shades easily adjust to let in just the right amount of natural light and, of course, this stunning natural view as well. 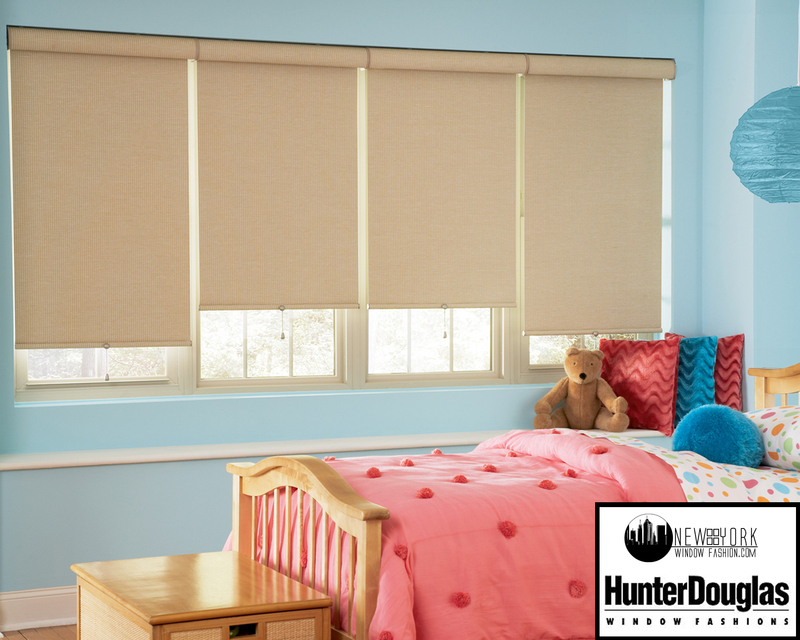 Color coordinated side panels on a traverse rod serve to darken the room entirely when nap time rolls around and give the shades an extra touch of class.